It’s nice to get good reviews, but it’s even better to get a review from a complete stranger that suggests the reviewer really understands what you’re after. Ron Jacobs is that guy. Read his article at Counterpunch.org, Going Down to Highway 61, Again. Finally, for all you West Marin folks – if anybody should appreciate the idea of the pursuit of freedom, it’s the citizens of the Independent Republic of Bolinas – I’m going to be having an ‘on-stage’ conversation with Steve Heilig (who did an excellent piece on the book in the Pacific Sun) at Commonweal (451 Mesa Rd.) 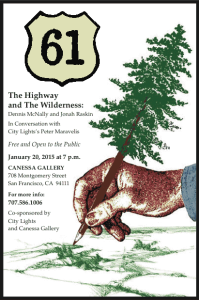 in Bolinas on January 7th at 2 p.m.